View cart “Aloeclear 60ml” has been added to your cart. Aloeclear Ultra is a stronger formulation for people with darker skin types or for those who suffer with continual ingrown hairs or razor rash after any kind of hair removal. Aloeclear Ultra roll on is a stronger formulation for people with darker skin types or for those who suffer with continual ingrown hairs or razor rash after any kind of hair removal. Featuring higher levels of Glycolic acid for maximum exfoliation and Shea Butter for maximum skin moisturisation. Aloeclear ULTRA will quickly and effectively combat even the most extreme cases of ingrown hair particularly on the bikini line and on shaving bumps on the neck. 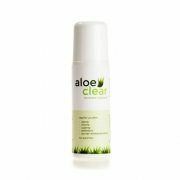 Aloeclear ULTRA has te same low sting formula that the original Aloeclear has and so is comfortable and pleasant to use. Aloeclear ULTRA has proved beneficial for people suffering with breakouts or acne due to the Salicylic acid and Glycolic acid in the formulation, never leaves skin oily or greasy. Aloeclear ULTRA has the same unconditional guarantee as Aloeclear original, so if you use it and your not happy you get your money back. Directions: Apply as often as possible for the first two weeks of use and then at least twice a day for maintenance.